The best polling on how Americans want to fix the budget and avert the fiscal cliff. The best poll around shows exactly how Americans want to avert the fiscal cliff. 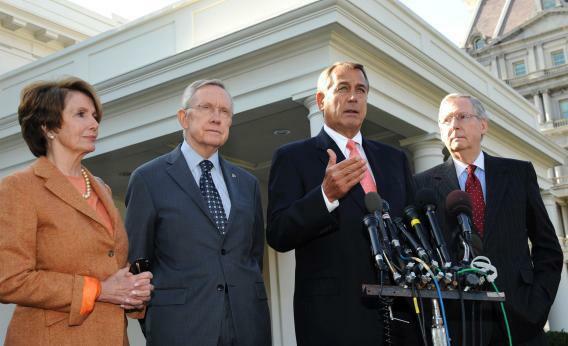 Nancy Pelosi, Harry Reid, John Boehner, and Mitch McConnell speak to the media. Photo by Roger Wollenberg/Getty Images. What would a people’s “grand bargain” look like? Republicans and Democrats are, of course, struggling to reduce the budget deficit in the long run and avoid the so-called fiscal cliff in the short run. Both sides claim to represent the preferences of the American people. The gist: We found that on average, people want higher taxes, cuts in government services, and military downsizing—but want to preserve Medicare and Social Security. Our poll differs from other recent polls about deficit reduction, because they asked questions in a vacuum. For example, if a poll just asks whether respondents favor cuts to Medicare or Social Security benefits, the answers don’t mean much, because the people being polled probably don’t know how much cutting Medicare would save, what total level of cuts to aim for, or what the alternatives are. Our poll, which you can try out here, gives our sample of Americans a specific deficit reduction goal: They must cut $900 billion from the projected deficit in 2022. We chose this amount because it would bring the projected deficit down by two-thirds, to a sustainable level in the long run. The target puts the specific options in context, and removes the luxury of avoiding painful choices. We gave 10 options for raising revenue or cutting spending—enough for real choice without being overwhelming—with cumulative savings of $2.1 trillion, and corresponding to deficit reduction options from the Congressional Budget Office. So what exactly does the people’s grand bargain look like? The most popular deficit-cutting option is an income tax increase, selected by more than 80 percent of participants. Relatively few respondents (35 percent), however, wanted to let the Bush-era tax cuts expire entirely. Instead, most respondents who favored higher taxes wanted taxes to return to Clinton-era levels for those making $250,000 or more (as Obama proposed before the election). The second-place choice, favored by about two-thirds of respondents, cut non-defense discretionary spending by 1 percent annually for an entire decade. Respondents chose this option even though the survey made clear that it would limit government services. Almost 64 percent of respondents favored reducing defense spending by 1 percent annually. Again, respondents chose this option in spite of a warning that this cut would harm military capabilities. Raising revenue by the elimination of an income tax deduction for state and local income taxes received the support of almost 60 percent of respondents. No. 5 is a surprise: A carbon tax, generally viewed as a non-starter even by environmentalists, received the support of more than 56 percent of respondents. Here we see how much context matters. People may hate the idea of a carbon tax in the abstract, but when faced with the alternatives for raising revenue, more than half of them support it. Gradually eliminating the home mortgage interest deduction received the support of slightly less than 53 percent of respondents. More than half of respondents—51.6 percent—favored repeal of the parts of Obamacare that expand coverage, a finding consistent with national polls that, unlike ours, present the question without context. No. 8 is another surprise. Our respondents showed a surprising willingness to add a 6 percent national sales tax. Previous polls have found that Americans reject a national sales tax by a two-thirds majority, but these surveys typically don’t show how much money the tax would raise. We included that information—based on CBO calculations, a 6 percent national sales tax would raise a whopping $408 billion dollars in 2022—and 50 percent of respondents got on board. These choices didn’t come easy. A full 15 percent of poll respondents initially chose not to cut non-defense discretionary spending and subsequently changed their minds when they reached the end of the survey and realized they hadn’t hit the $900 billion target. Support for cuts to defense spending, carbon taxes, sales taxes, and tax code simplification also rose by more than 10 percent on a second go-round, after respondents initially fell short of their goal. In short, people found many tax increases and spending cuts undesirable, but in the context of informed deficit reduction, necessary. The least popular deficit reduction options, by a significant margin, were cuts to entitlement programs. Only 27 percent of respondents supported cutting Social Security for the elderly, and only 34 percent supported cutting Medicare. These findings are consistent with other public opinion research, but what’s striking here is that people were reluctant to cut Social Security and Medicare even when they fell short of their deficit reduction target, and were forced to consider more of the options we gave them. The results of our survey offer some perspective on the fiscal cliff negotiations in Washington. Americans, it appears, support the broad outline of the fiscal cliff: deep cuts to discretionary and defense spending, increased taxes, and stable entitlement benefits. The people’s grand bargain may look more like the fiscal cliff, in fact, than the current likely alternatives. Before Congress and the president resolve their differences by cutting entitlements and preserving defense spending, perhaps they should spend the holidays talking to their constituents.